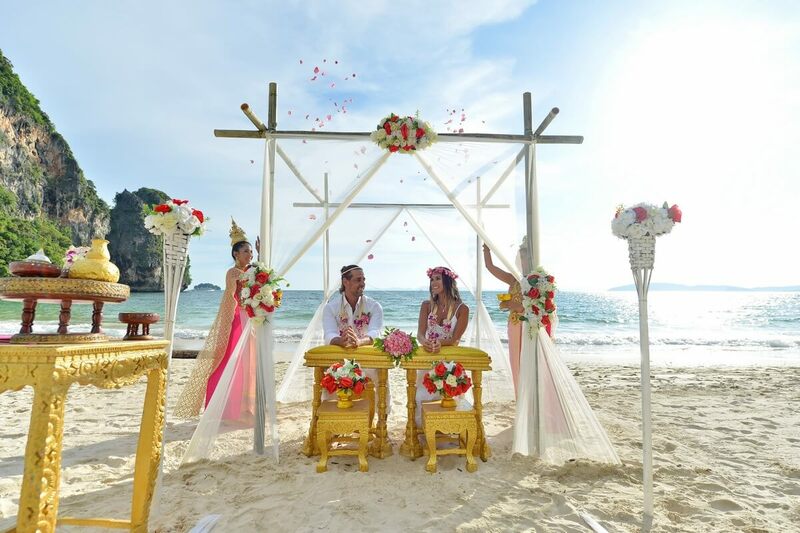 There are a number of ways the ceremony can be conducted and we have two main Thai wedding packages, each with various options. 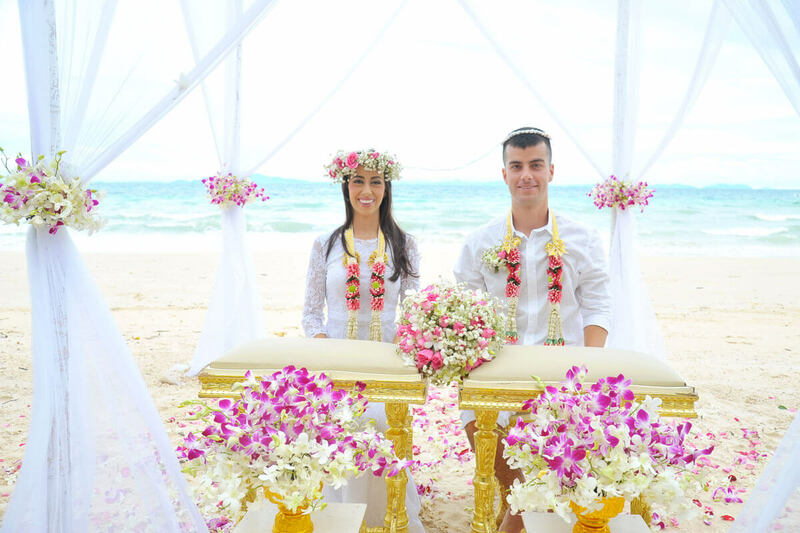 Our Thai Wedding Standard Package is designed for smaller parties or budgets. 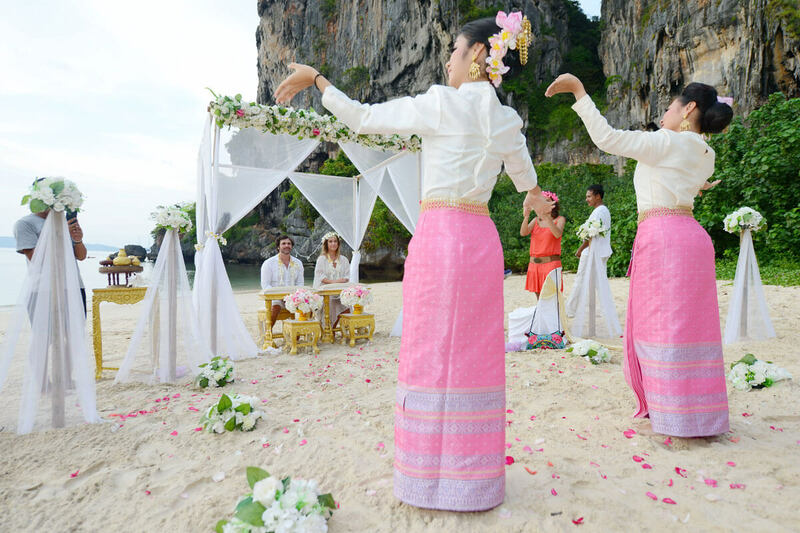 The basic package includes traditional Thai costumes, photo session at a temple and ceremony at your choice of venues. 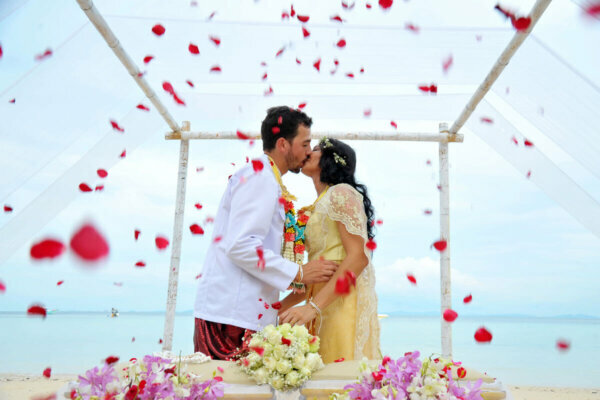 After a warm welcome and introduction by the celebrant, we will conduct several important rituals, including the giving of flower garlands to the couple, painting dots on their foreheads and placing linked head slings upon their brows. 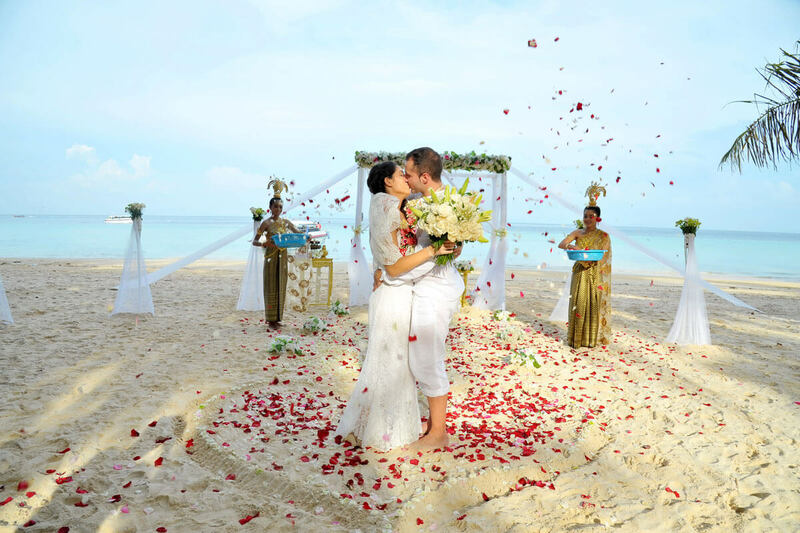 As you can imagine our Thai Wedding Grand Package has this same wonder plus so much more. Firstly, before the wedding the couple embark on a photo session that can take place either at an elephant camp on back of these majestic icons of Thailand (traditional weddings in the past used elephants) or at the beach. After this, the bride and groom will be blessed by monks at a Buddhist temple before attending the wedding. The wedding proper begins with the groom, accompanied by the celebrant, leading the colorful “Long Drum Parade” with vibrant musicians across the garden or beach to where the vows will take place. The groom and guests will be carrying gifts and money to present to the bride’s parents (or representatives). Along the way, the groom must pass through 3 Gates and respond to questions posed by the gatekeepers. If his answers and gifts are acceptable, the bride, who has been hidden nearby, will come and join her betrothed to first pay respect to the parents, then undergo the rituals described in the Standard Package. The ceremony is completed with the newlyweds planting a “Love Tree” as a gesture of their everlasting love. Cake, Champagne and more romantic photos are the final touches before the couple is transferred back to their hotel or dinner venue. We also offer a most memorable Thai Buddhist Blessing with the preparations of the day beginning with early morning offerings to the Monks in front of the Thai temple at a small shrine, set up especially for the occasion, offering of flower, food, and a traditional bowl of rice.